Who was Amy Winehouse? Yes, we all know she was a talented and a 6-time Grammy winning British musician, who died tragically at the age of 27. But, who was the real Amy Wineshouse? How did she die and how did this happen in this day and age in London? These were some of the questions that director Asif Kapadia had in his mind and wanted to find the answers to them. He found the answer to his questions in Amy’s diary and the lyrics of her songs. Kapadia says he wanted to reveal the Amy Winehouse that nobody knew. The result is a brilliant and riveting documentary called Amy told in the singer’s own voice with help from her family, friends and agents. This is not the Winehouse we knew. This is not the Winehouse that we got to see or read about on TV and magazines. This is a very different Winehouse, who was at once shy in front of camera and confident singing in front of an audience. She was nervous about becoming famous. In the film we see the slow unravelling of a talented singer and an abandoned child in search of love. Love is the theme Kapadia explores in the film, and love is the theme that Wineshouse explores in her songs. If I have to sum up the film it is about love says Kapadia in an interview I did with him in San Francisco. We spoke to Kapadia about the making of Amy, his editor Chris King and his fascination with eyes. And since Kapadia mentioned Bollywood, we asked him about Irrfan Khan and his plans to make a film with him. And, I did ask Kapadia about Amy being shortlisted for an Oscar, and he offered an interesting answer to that question. Amy is one of the five documentary films shortlisted for the 2016 Oscars and has a strong chance of winning the award. 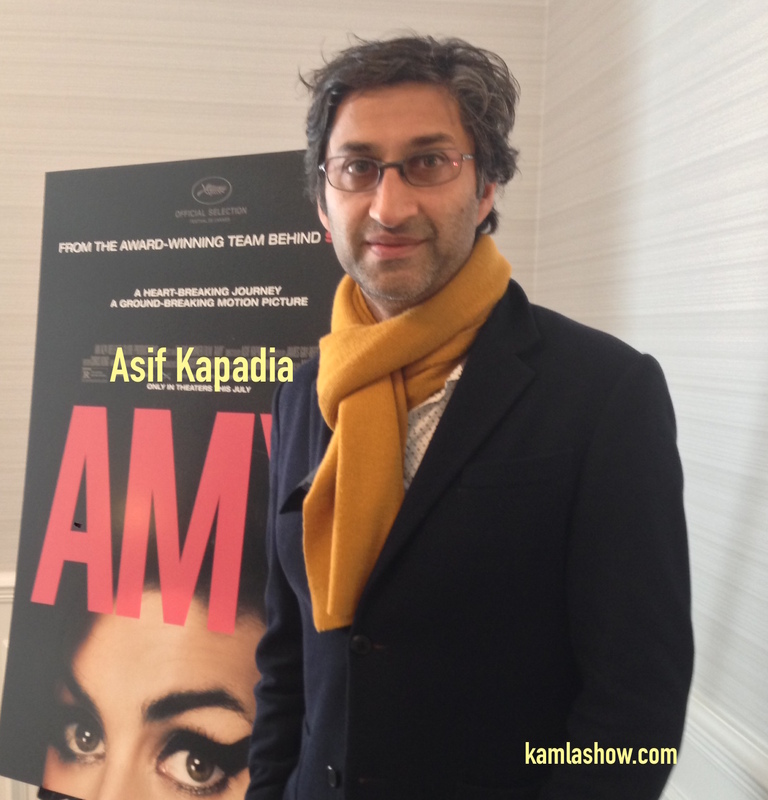 Amy is my Bollywood film says Kapadia. He explains how in the beginning he drove around London listening to Wineshouse’s music in his car. And then at some point he started to read the lyrics of her songs and had a lightbulb moment. “This is for me a Bollywood film. This is a musical, where the songs are the narrative. Amy is the most eloquent in her song writing,” he says. Music then forms the spine of Kapadia’s narrative on Winehouse. Kapadia interviewed over a 100 people for the film. He ended up using audio interviews from about 23-25 people. He combined the audio interviews with video footage of Winehouse from her friends, and the interviews that she gave along with the lyrics of her songs. initially Amy was about 4 hours long. They eventually trimmed the film down to 2 hours and 8 minutes. Kapadia takes a middle path in the film. He lays out all the information and leaves it to his audience to judge where they stand vis-a-vis Winehouse, a talented artist, who was manic depressive and an addict. Like many of the viewers who have seen the film you might find yourself wanting to reach out and tell Amy “No, don’t do that” or “Don’t listen to them.” You want to save her. But, tragically it is too late. The film will elicit an emotional response from you, which means Kapadia has succeeded in connecting with his audience, which is always an elusive goal to achieve for a filmmaker. Amy releases in the San Francisco Bay area on Friday, July 10, 2015.